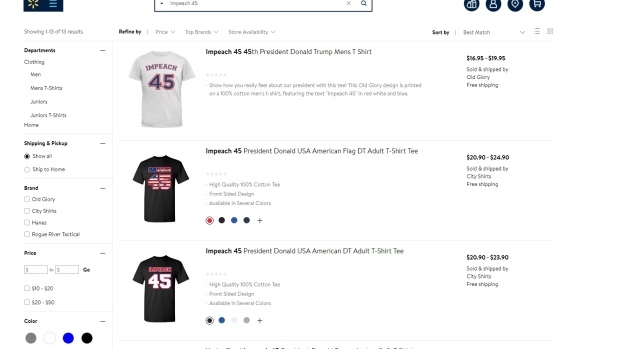 Walmart Inc.’s (WMT.N) website is selling t-shirts from third-party sellers with “IMPEACH 45” emblazoned across the front in big capital letters -- a call to bring down the 45th U.S. president, Donald Trump. The shirts that come in several shades -- plus similar baby onesies and even frisbees -- have the Twitter-sphere in a frenzy and spurred a grassroots call to boycott the world’s biggest retailer. The hashtag #BoycottWalmart even began trending on Twitter. Amazon.com Inc. (AMZN.O) had oodles of impeachment merchandise, too. There were “Impeach 45” football jerseys, tank tops and sweatshirts.